This fine example of late 19th century Italianate architecture was designed by renowned architect G.A. D'Hemecourt and built for Dr. A. Dupaquier in 1879. For many years while a private residence the home was known as The Dupaquier House. Perhaps its most notable incarnation came in 1971 when jazz bassist Charlie Bering and Lula Lewis opened a night club on this corner that quickly became known as a focal point for the modernist jazz movement. Lu and Charlies: Potables-Sustenance–Jazz hosted the likes of Ellis and Wynton Marsalis, Lady BJ Crosby, James Booker, Alvin Baptiste and many other jazz greats. The club closed in 1977, and after a 1982 historical renovation the building re-opened as Menefee's Restaurant. 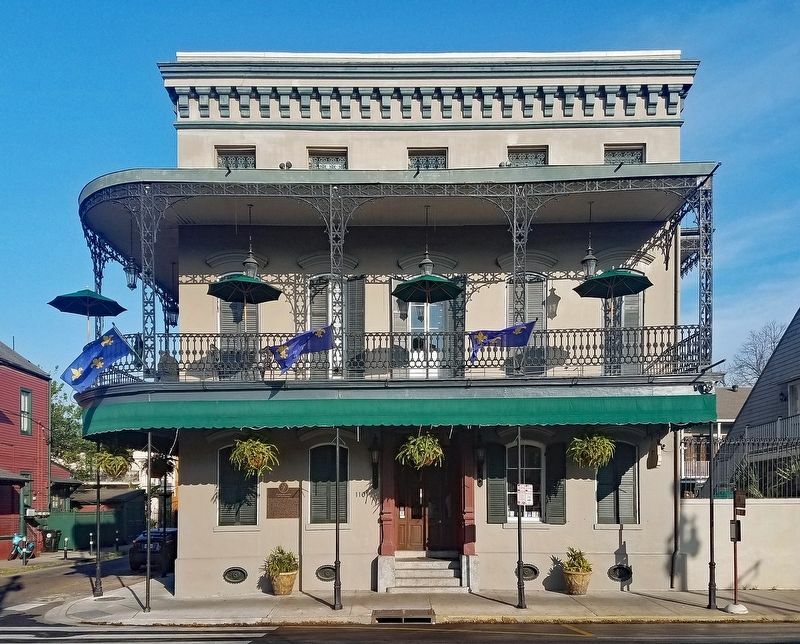 Today the building houses the New Orleans Courtyard Hotel. height on the lower left. Marker is at or near this postal address: 1101 N. Rampart Street, New Orleans LA 70116, United States of America. Touch for directions. Other nearby markers. At least 8 other markers are within walking distance of this marker. Saint Augustine Church, New Orleans (about 500 feet away, measured in a direct line); Tomb of the Unknown Slave (about 500 feet away); Carmelite Chapel of St. Joseph and St. Teresa and the Carmelite Monastery (about 600 feet away); Carmelite Monastery (about 600 feet away); Italian Hall (approx. 0.2 miles away); Louis “Satchmo” Armstrong (approx. 0.2 miles away); Maison Hospitalière (approx. 0.2 miles away); St. Aloysius College (approx. 0.2 miles away). Touch for a list and map of all markers in New Orleans. More. 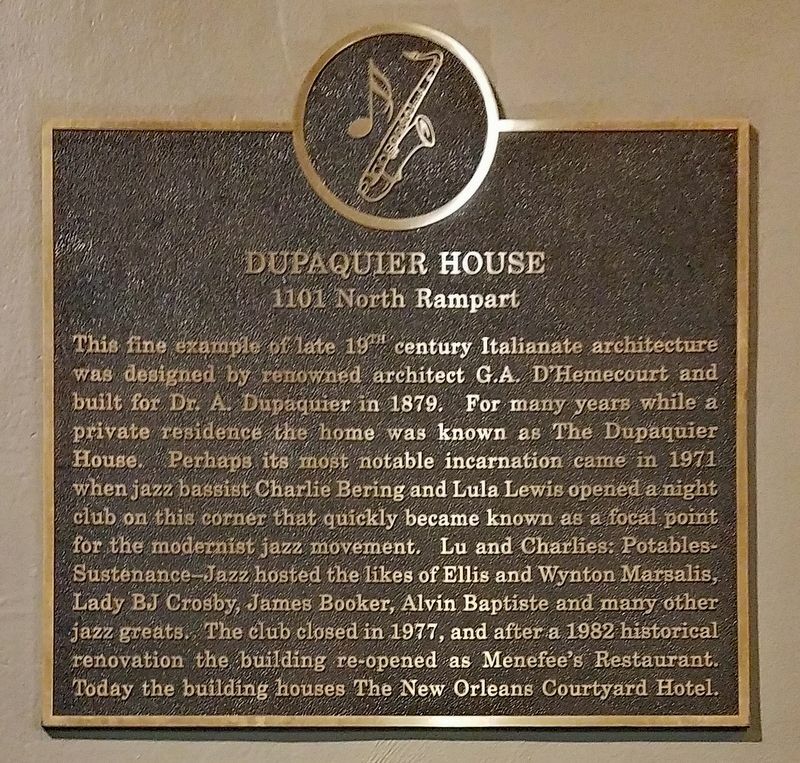 Search the internet for Dupaquier House. Credits. This page was last revised on March 25, 2019. This page originally submitted on March 24, 2019, by McGhiever of St Paul, Minnesota. This page has been viewed 40 times since then. Photos: 1, 2. submitted on March 24, 2019, by McGhiever of St Paul, Minnesota. • Andrew Ruppenstein was the editor who published this page.